Why Instagram? You have a lot of options for social media, and if you aren’t already active on Instagram, it might feel like One. More. Thing… but Instagram is the best place for businesses to be. Because of the simplicity of Instagram (photos only! ), the content is strong and not diluted by a million rabbit holes of links, videos, groups, and memes to lose your audience to. Instagrammers love to stay on Instagram, which I see as a really good thing. Engagement is higher on Instagram than on other platforms, making it the ideal place to connect on a personal level with your fans and customers! If you are just getting started, I’m listing out for you my top Instagram tips to help you be successful. However, general social media marketing best practices still apply! Things like treating other users the way you want to be treated, not oversharing, participating in the community, and sharing only high-quality content are key. Niche down and get specific – Instagram works best when you narrowly focus the content that you share. It’s not difficult to find large, successful accounts dedicated to things like: Paleo cooking, fitness, knitting enthusiasts, quotes, etc. As a business owner, you probably have many interests, but when it comes to your Instagram, keep it on topic. Trust me, the right people will find you. Know who you are talking to – As a smart business owner, you already know that “everyone” is not your customer. Even if you product has mass appeal (food, fitness, quotes, etc.) you should still have specific customer “avatars” that you are trying to reach. Being aware of who this ideal customer is will help you focus your content. Before someone decides to follow you, they will most likely click over to your bio to see what you are about. This makes your bio content a critical first impression, so make sure yours is in tip-top shape! Pick a good username – Stay simple here, folks! Your username should be your business name or your real name, without extra characters or weird punctuation. It should be easy to remember, pronounce and spell. If someone is already aware of your business, they should be able to find you easily on Instagram by simply typing in your business name. Use a great profile picture – Your picture should be clear and close up. We want to see your face! Some people choose to use their logo, and that is up to you. However, I feel that ultimately people want to connect with other people on Instagram, and your face is clearly the more personal choice. 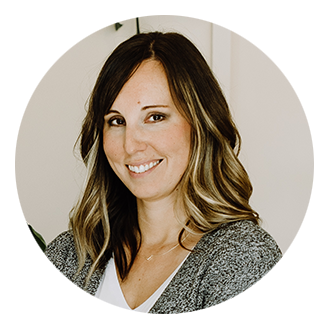 Make your photo pop by wearing a bright color (bonus points if it’s one of your brand colors) or using some kind of prop that is related to your business. If you are a food-related account, hold and apple. ; if you are a sewist, sport a pair of scissors, etc. Answer questions with your description – I’m a fan of keeping things pretty simple here as well. You only get 150 characters, and the most important thing is to answer your potential customer’s questions. Critical information like: what type of business you are, location, hours of operation, how they can contact you, etc. If you still have room after you’ve answered the basics, you can add something personal, creative, or intriguing! Spice things up with Emoji – We are visual creatures. Adding some emoji to your bio can break up the text, and make it more readable for people. Depending on which characters you pick, they can be little visual cues about the words you have typed. List vs. paragraph – When you type out your profile description inside the Instagram app, it will appear as a paragraph, but some people prefer that their description appears in a list format (I’m one of them, I think it makes it easier to read). To do that, try typing out your description text in your phone’s note pad or something like Evernote. Then copy and paste into Instagram. Track your link – You only get ONE live link on Instagram, and it appears in your bio. In order to keep an eye on exactly how many people are clicking through your bio to go to your website, newsletter sign-up, or shop, use Bitly.com to shorten your link. When you put the Bitly link in your bio, you can log back in to Bitly at any time, and see exactly how many people have clicked on that link. Being able to know how many people are following your link helps you measure the effectiveness of your Instagram marketing. Visuals matter – Instagram is all about pictures, which means you can’t get away with grainy, poorly lit, messy photos. You also don’t have to be an expert photographer! Being a lifelong student, and always working to improve your photography skills is enough. If you aren’t strong in this area, start working on it today. Tie your look together – There are many ways to create a “cohesive” look. Think of Instagram as a magazine. All of the pages should look like they are part of the same magazine. Some ways to tie your visuals together are having a consistent color palette, using the same backdrop for all your pictures, or having a certain lighting setting or filter that you use. Find your style and stick to it! Planning ahead keeps you consistent – While the best Instagram accounts look spontaneous and free-flowing, they aren’t. Great Instagrammers are meticulous planners! I recommend coming up with 10-15 types of content you can post in a rotating pattern, so you never run out of content. An example is something like: a quote, behind the scenes, how to, customer testimonial, audience engagement question, etc. Batch process your images – Along with planning ahead, try to prepare the content, including the images, in large batches. Edit 10 photos at a time instead of one, and write your descriptions for the week and pre-schedule them, instead of trying to do it on the fly from your phone. When you don’t batch process, it can start to feel like Instagram is taking over your life, so do yourself a favor! Stop the scroll with a great “hook” – When people are scrolling through their Instagram feed, they will only see the first 150-ish characters of your description. Make them want to pause and finish reading by grabbing their interest. Say something provocative and curiosity-inducing, or ask a question. Use apps to take your visuals to the next level – There are hundreds of great apps out there for both iPhone and Android that can amp up your visuals by adding text, frames, and other effects. Use 30 per post – Yes! You can use up to 30 per Instagram post and I believe it’s best to always use all of the tools that I have available to me. Put hashtags in as a comment – So as to not muck up your awesome description with a mess of hashtags, paste them in as a comment immediately after posting. They still work, but it keeps your description clear. An added bonus is that after you get a few additional comments, the comment containing the hashtags will be hidden. Use my ‘2-Word Hashtag Rule’ – Often hashtags that have two words in them, like #portlandartist, are more targeted and bring in better traffic than #portland and #artist listed individually. Check for spam – Before you use a hashtag for yourself, search it on Instagram and see what results it returns. If you see a lot of spammy posts, you will most likely get spammy comments. Skip these and find new hashtags! See if you get what you expect – As you are checking for spam, also look to see if the results are relevant to your business. Sometimes hashtags have unexpected meanings! If you don’t see what you were expecting, this is another sign to look for a different hashtag to use. Follow at least 10 accounts in your niche – You might call them “competitors” but you need to become friends! 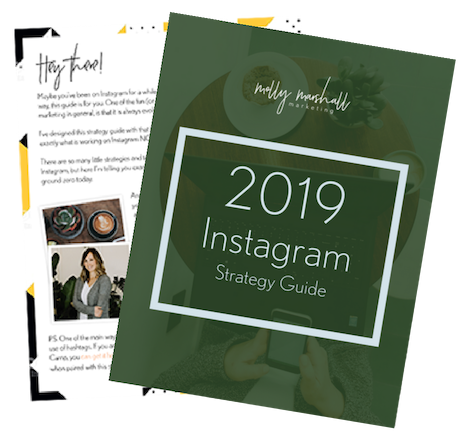 Instagram is a community, and you can greatly benefit by connecting with others in your niche. You can also learn a lot from people that are already being successful on Instagram in your space. Respond to all comments – As you are trying to build engagement on your account, be sure to respond to all comments! Instagram should be a two-way conversation. When you personally respond to a comment, it makes it more likely that someone will comment again, build your engagement over time! Seek out ideal followers – Don’t just wait for people to come to you! Spend time each day looking for your ideal customer. What hashtags do they use on Instagram? Search those hashtags and spend some time liking and commenting on their photos. If you’re reaching out to the right people, many of them will pop over to your account and follow you. 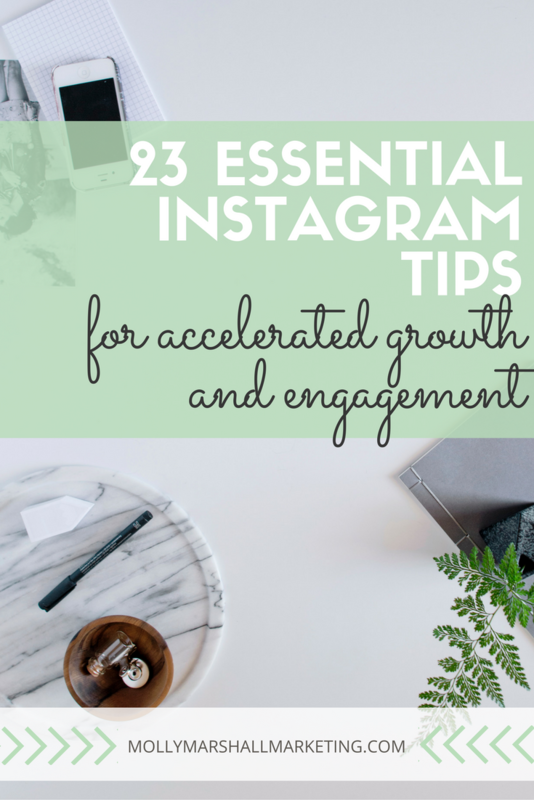 Instagram is a fun and rewarding platform to be on for any business, but it takes planning, coordination, and the right tactics to grow an engaged audience. Which of these Instagram tips were new to you? Do you have any to add to the list? Fantastic tips, I especially agree about engaging with other people in your community! Thanks for great tips! Thanks for that, I should probably update this post. Things get out of date so quickly!